This webpage was set up to help users remove SpywareQuake. We do not endorse SpywareQuake. SpywareQuake is the latest variant of rogue programs using adware and false alert messages to sell their product. Other variants were known as SpyAxe, SpywareStrike and SpyFalcon. SpywareQuake is promoted on its homepage as a solution to help users detect and remove spyware and malware from their PCs. 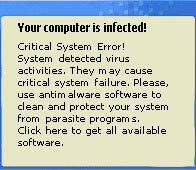 It is actually a rogue antispyware program that uses pop-ups alerting the user about a critical system error and virus activities. The pop-up is actually an advertisement designed to scare the user into purchasing SpywareQuake. There is no system error or virus infection, except for the Trojan that may have been installed to download SpywareQuake's adware. SpywareQuake's adware program produces the fake alert messages. To fix this problem, the adware program as well as any possible installers and downloader Trojans that may be connected with it need to be found and removed from your PC. Scan your PC and remove all infections. Scan your PC a second time and remove any remaining infections. A reply email will be sent which includes your support ticket number. Once your log file is analysed a technician will contact you to help you resolve your problem. To prevent future infections from malicious and rogue programs such as spywarequake it's important to always install the latest Windows security updates and use a reputable anti-spyware product such as STOPzilla that provides real time protection. If you have any questions regarding spywarequake removal please feel free to contact us. P.S. If you found this information useful please consider linking to us to help others remove spywarequake - Spread The Word. The owner of this website is NOT affiliated with and does NOT endorse SpywareQuake, Spyware Quake, SpyQuake, SpyFalcon, SpywareStrike, SpyAxe or any of their variants.